Centrally located and easily accessible to the Mid-Atlantic Region, McDaniel College, in historic Westminster, Maryland is only 30 miles from Baltimore, 66 miles from Washington D.C., and 60 miles from Harrisburg, Pennsylvania. The beautiful 160 acre campus with its traditional buildings, classic charm, and on campus golf course, is surrounded by forests and fields. The hilltop campus offers breathtaking views of the Blue Ridge Mountains. McDaniel College is an ideal site for a football kicking camp. 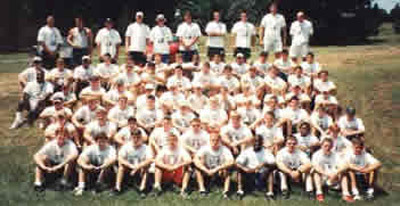 The Baltimore Ravens conducted their summer camp there until 2010 when they built their own facility just down the road in Owings Mills, Maryland. The NKS camp utilizes the same facilities the Ravens enjoyed including the artificial turf stadium which was installed by the Ravens. While McDaniel College competes (quite successfully) at the Division 3 level, the athletic facilities are those of a much higher intercollegiate level of competition. The overnight accommodations for the NKS camp are more of a luxury apartment than a typical college dormitory. The camp is housed in the “North Village Apartments” which provide campers modern suites with a complete kitchen and living room. It’s a short walk to the field, dining hall, and meeting rooms. McDaniel College was founded in 1867 and known as “Western Maryland College” until 2002. It is a private liberal arts college with 60 undergraduate and more than 20 graduate programs. It is profiled as one of the 40 colleges in the book, “Colleges That Changed People’s Lives”. In 2011, The Weather Channel ranked McDaniel College 6th in the USA as “Best Tailgating Colleges” due to the ability for fans to park their cars practically on the football field and actually grill and drink, a tradition that dates back to the 1920’s. McDaniel College annually ranks in the “Top Five” for average Division 3 attendance. Whether you’re staying in the Westminster area, venture off to the nation’s capital, take in a Baltimore Orioles game, or visit the nearby Blue Ridge Mountains, this special region of the USA offers a multitude of activities for all. And don’t forget Gettysburg National Park. While the park is visited by thousands yearly for its obvious historical significance, people come to the park for the sheer beauty of the rolling hills and sweeping vistas. Here is a short list of area attractions. Baltimore Ravens Training Complex, Owings Mills, Maryland – Check out the tours and dates for mini-camps and summer training camp. Washington Redskins Training Center, Richmond, Virginia – Check out the tours and dates for mini-camps and summer training camp.